The miCoach SMART RUN watch delivers an advanced, intuitive blend of coaching and performance data that was designed to help serious runners maximize training every time you lace up your shoes. The watch delivers a strapless continuous heart rate, GPS, Bluetooth 4.0, wireless music player, WLAN and a color touch screen. The device works with the miCoach training system and helps you progress to be the athlete you want to be. It provides the avid runner with everything they need in a single device. Meet your new fitness companion. With Fit Smart, you?ll never miss a beat?or step. You can track your all-day activity and when you?re ready to work up a sweat, fire up the built in heart rate monitor to get in the zone. 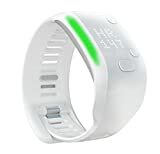 adidas fit smart features continuous wrist based heart rate technology ? no chest strap required. This fitness monitor provides simple to understand visual coached guidance for workout intensity and calorie burn to keep you on track, motivated and training smarter and more effectively. Our fit smart watch features a built-in accelerometer tracking speed, pace, distance and stride rate for walking, jogging and running. Sync your data, using Bluetooth smart on your smart phone, with the adidas Train & Run app to see your progress. With the adidas Train & Run app you?ll also have access to 100s of training plans created by the elite coaches at EXOS. Here are some of the key features of the new Fit Smart: Vibration and visual prompts that provide feedback and coaching : Set daily and weekly goals to keep track of your progress. : Stores up to 10 hours of workout data : Access free training plans through the new and improved Train & Run app. : Fit Smart is compatible with iOS and Android 4.3+. Who is the miCoach User? adidas created miCoach sports fitness watch because we fundamentally understand that every athlete can be better at his or her sport, no matter the level. We enlisted the help of world-renowned coaches to create sport-specific training plans to make athletes better at their chosen sports. miCoach offers both Cardio and Strength & Flexibility plans to improve your strength, power, speed, agility and flexibility. What type of workouts can the adidas fit smart track? Cardio, Strength & Flexibility: miCoach uses a unique form of heart-rate-based interval training for CARDIO workouts varying intensity between four personalized training zones. As well as tackling the guided Strength & Flexibility workouts that include weight, repetition and circuit training.